When I first started experimenting with printing designs on paper and gluing them to wooden pawns (which I termed digitally painting), I used my inkjet printer at home for printing out all of the designs. After I finally settled on a design, I laid out a large sheet of all the components and printed them up using an HP Color LaserJet. One of the things I immediately noticed was that the colors went darker. But, as I was hurried to get some figures out for a convention, I only did as many as I needed; I set aside the remainders on the sheet I had printed to do them later. Well, I have gone back to the remainders and have been working on finishing the rest of the British squad; six figures are just not enough. So I started building the remaining six. As I started working with the paper, because it is handled much rougher than a normal page might be, the dried toner started flaking off. Now I noticed this when I originally started building the figures before the convention, but this time it seemed much worse, so I suspect that some slow-acting chemical reaction is still occurring and the toner is continuing to dry out and harden, making it brittle. So, the solution seems to be to fix the toner to the page. As the figures that I game with have not exhibited flaking after they were finished, I can assume that the varnishes I put on have done a sufficient job of fixing the toner to the paper, so I tried an experiment while building. I brushed Future acrylic floor wax (the acrylic painter's miracle fluid) on to the paper over the toner and let it dry. This seemed to completely solve the issue, plus it brightened the colors (which may or may not be a good thing, depending upon your point of view). One final note: the paper will warp, of course, when you wet it with Future, but by rubbing the back of the paper you can control the curling and remove the wavy effects in the paper. 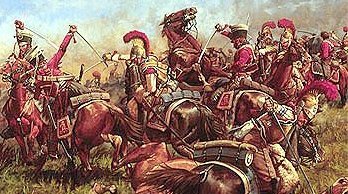 This blog entry will be the first in a series about "stock of the trade", of the craft parts I use for my wooden toy soldiers. 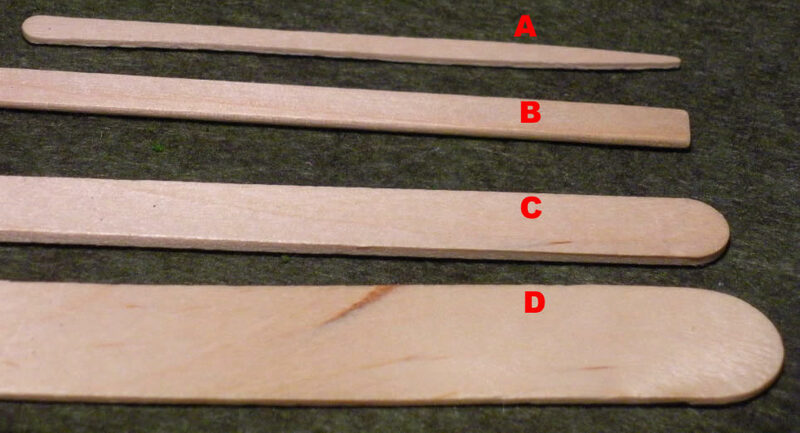 First up are basic stick: the flat toothpick, the coffee stirrer, the popsicle stick, and the large craft stick. All of these are the Woodsie brand. First up ('A' in the picture) is the flat toothpick (or Craft Pick). These are approximately 3 1/2" long, 3/16" at the round end, the 'point' being approximately 3/4", and the whole being about 5/64" thick. I use the pointed end for a musket or sword, and the rounded end for a plume or scabbard. A fair number of these can be "bent", so will not be good for long parts. Next ('B' in the picture) is the coffee stirrer (or Skinny Stick). These are approximately 5 3/4" long, 1/4" wide, and 3/32" thick and are flat on both ends. You can use these for feet or arms of smaller figures, and shoulder boards for larger figures. I haven't really used these as much, but they would also make good scabbards and small pieces. 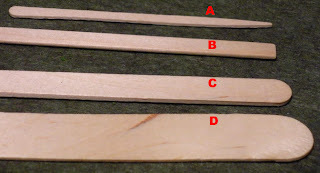 Third ('C' in the picture) is the popsicle stick (or Craft Stick). These are approximately 4 1/2" long, 3/8" wide, and 3/32" thick. I have found a number of these to be concave on one side, which makes it good for gluing to a dowel. Some are also defects and appear "bent" (they are actually just cut or planed crooked). These used to serve as the basis for larger figures' feet - I use heart shapes now - but are still a primary component as they serve as the arm for larger figures, along with shako peaks and cartridge boxes. Finally ('D' in the picture), we have the large craft stick (or Jumbo Craft Stick). These are approximately 6" long, 3/4" wide, and 1/16" thick. Note that these are thinner than the normal craft sticks! I have not used these for anything yet, but they will be used for my next experiment making a pickelhaube (see the previous experiment). Next installment of Stock of the Trade will show two of the three types of clothespins you might try to use as the basis for a figure, along with some pawns. 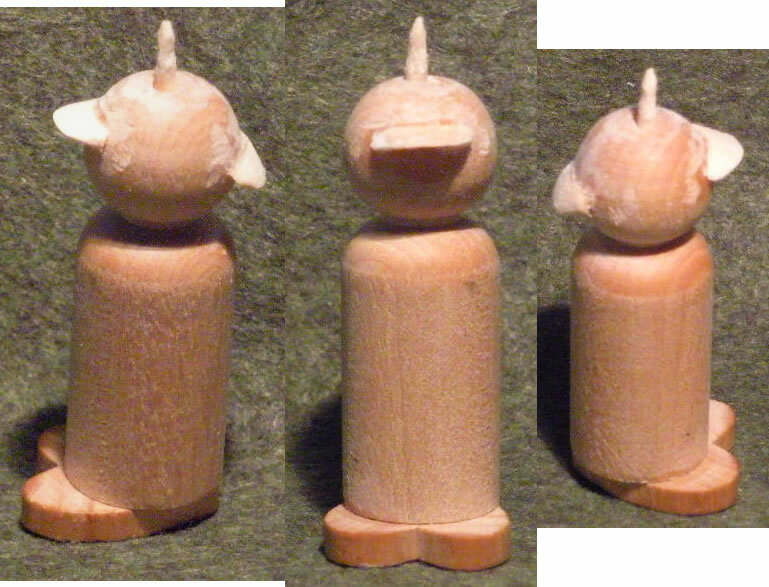 This is the third of three special figures I am making for the French Ligne unit I have started. The other two, a drummer and a vivandiere, are complete; all that remains is the Eagle Bearer. 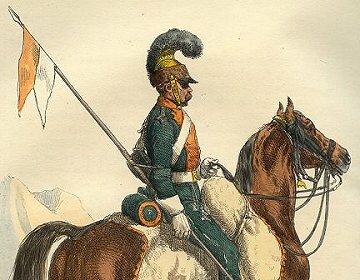 When I made my officer for the French Legere unit, I found that he was not really distinctive enough on the battlefield, so for this figure I wanted to differentiate it from the privates. 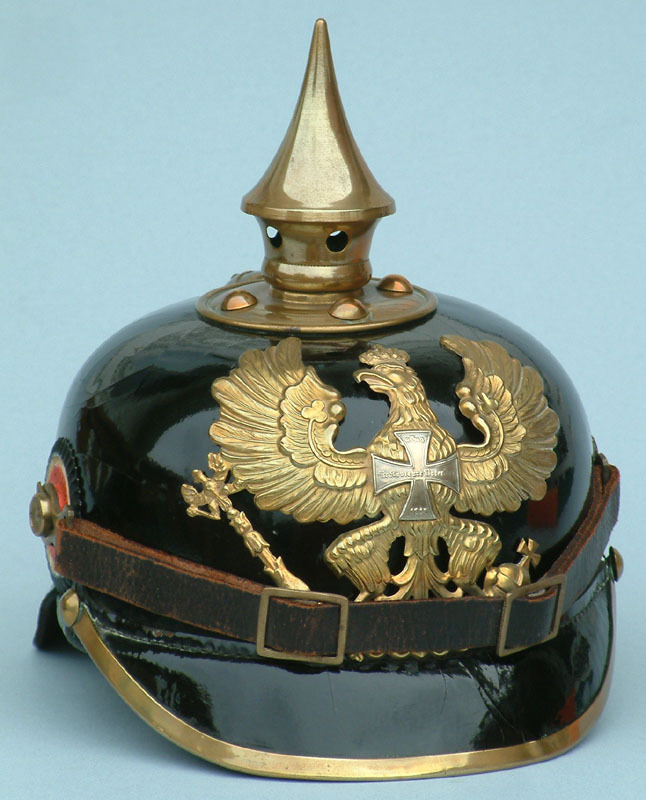 One way to do that was to use a bicorne instead of a shako. This would be challenging, but interesting, because the hat is so large and exaggerated. The good part is, most pictures of bicornes are different from all other pictures of them, so it seems like there is a lot of latitude in defining the shape. 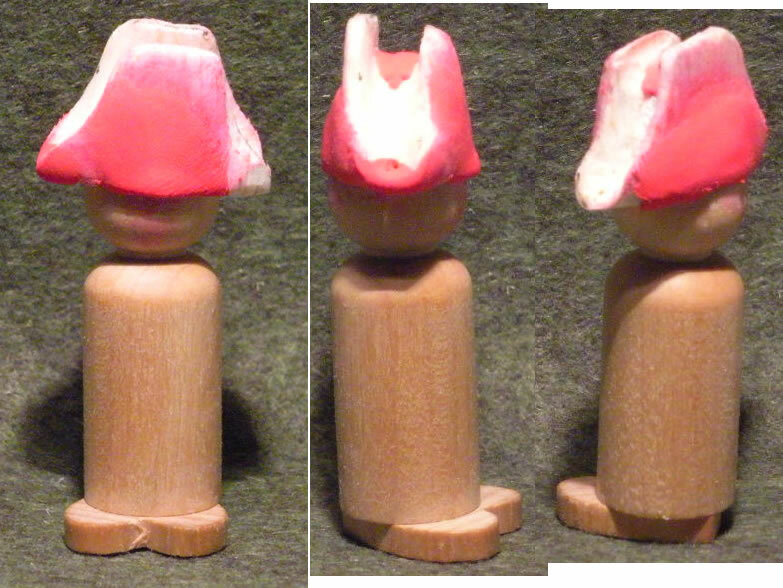 I started with a block of balsa wood - in hindsight one that was not deep/thick enough to encompass the whole head - and created a head-size hole in the bottom and glued it onto the pawn's head. I then drew out the basic shape using a pencil (note: use a pen, as pencil rubs off on your fingers) and then started grinding away large sections of the unneeded material. As I had not started with a large enough piece of wood, and because balsa is brittle, I needed to use modeling material to create a better shape and repair some of the damage. 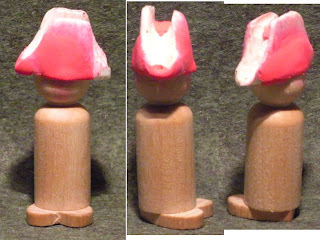 I was not really looking for a perfectly sized hat here, given that the figure itself is shaped in a cartoony way, so it being a little oversized was actually preferable. After the hat was complete I added more material to create the greatcoat 'skirt', in the same manner as with the French vivandiere. As you can see in the final picture, the top of the bicorne was smoothed out a bit, and a pom-pom added. I've added a sword for the right hand, a flintlock pistol for the left, and the scabbard is peeking out from under the greatcoat. All in all a simple figure, but one which has a bit of character. 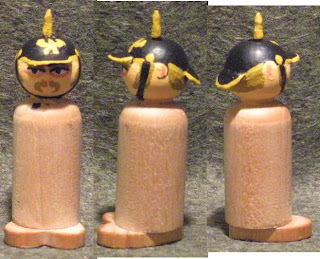 The next figure you see in this series will be the Eagle Bearer. Then back to the British.